[Outline] Nagano Reisenji @Marukomachi, Chiisagata-gun It is a hidden hot spring of an in a mountain upper hillside. 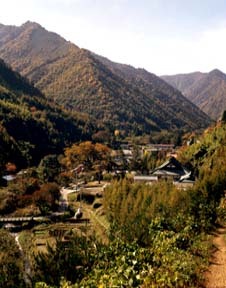 It is an enough hot spring at the place which the mountain surrounded the upper part of a reisenji river, and the four quarters, and old nature was left behind as it was, and extended far back.In a hot spring resort entrance, the big tree of a miraculous fountain Zen temple and a zelkova is an enough.The hot spring which prospered as a hot spring belong to temple of a miraculous fountain Zen temple.The public bathhouse of the countrified air is also popular. A miraculous fountain Zen temple is visible a reisenji complete view and on the right of middle, and the big tree of a zelkova is visible to a left hand. Hypertension, the stomach and intestines, hemorrhoids, neuralgia, rheumatism, gout, a wound, a burn, a skin disease, atopic dermatitis, etc. A reisenji entrance, the "Miyazawa bus stop"
Nagoya -> Matsumoto station -> kakeyu going bus -> terminal "kakeyu"